On March 2, 2016, a CUPE 1004 member from the Portland Hotel Society was featured in an article by the Georgia Straight as one of the 6 noteworthy feminists battling gender bias in Vancouver. Stacey Forrester combats public harassment as part of Hollaback Vancouver and Good Night Out Vancouver. History was made during the last provincial by-election. 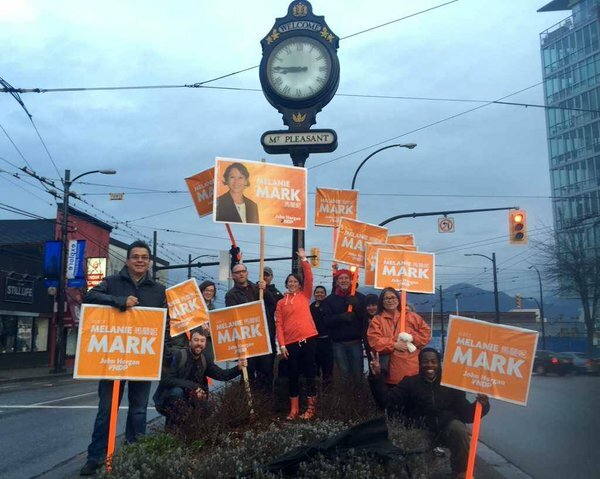 In the Mount Pleasant riding, Melanie Mark was elected, and she is the first indigenous woman to be elected to British Columbia’s legislature! Melanie has deep roots in the community and is dedicated to working to address the issues for this riding, while representing the BC NDP’s. One of CUPE 1004’s member’s, Andy Healey, who regularly works at the Portland Hotel Society and was booked off by the local for one month to dedicate his time to helping Melanie Mark’s NDP campaign. Some amazing things that Andy was able to coordinate include coordinating in the Downtown Eastside on election day, hundreds of unregistered voters had a chance to access democracy in the historic by-election. This is just a part of the great things that he was able to do to help the campaign. Thank you Andy for your hard work and dedication! The Executive is excited to continue to do the work it has been doing and is looking forward to strengthening our Local. Our Secretary Treasurer, Brother Frank Lee has been elected to be a General Vice President of CUPE BC. 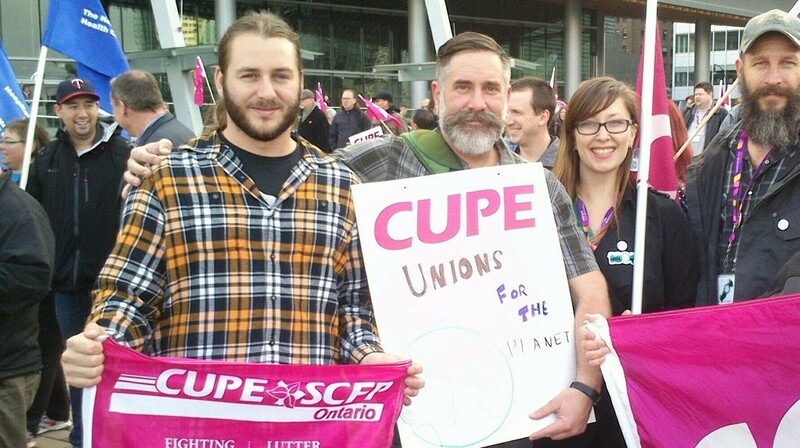 We are incredibly proud of Frank and know he will do an excellent job advocating for CUPE members around the Province and be a strong ambassador for 1004. The City & Parks Bargaining Committee had a second day at the table with the Employer and has begun to work on addressing proposals. The Committee will have a third day tomorrow and have scheduled four days for February and early March. An update will be sent to City and Parks members. The Committee had a full day of training with over 70 CUPE leaders from each municipal CUPE local Bargaining Committee from across the Lower Mainland. Regional priorities were discussed and information was shared. Dedicated bargaining coordination meetings with CUPE 15 & 391 are underway and will ensure we share updates and work on common concerns. The Portland Hotel Society had its bargaining proposals ratified by its members at meetings on January 13 and we have now given formal notice to bargain with the PHS. The Joint CUPE 1004/1936 Bargaining Committee will be in discussion with the employer about next steps and setting dates to get to the table. Our members concerns with the Labour Adjustment Plan have been brought to the employer and a draft of the revised proposal will be brought to the membership soon. Brother Ryan Petrin has been elected as a Steward for the Branch. The Local has resolved three Bridge Crew and an OT grievances and will be adding resources to work on the backlog of other outstanding grievances. The Local has won a significant promotion grievance getting our member posted to a Sub-Forman III position. The Branch Manager will be sharing the 2016 metrics with the Local in a meeting next week. OT and call out policies are still being worked on with management. The Local will have a booth at the AGM on Feb. 4th. The Local is preparing for our Pump Mechanic Arbitration which has dates set for April. Steward and our BA continue to work on outstanding grievances. President Andrew Ledger and Unit Chair Paul Baratta will be visiting crews on Jan. 29. 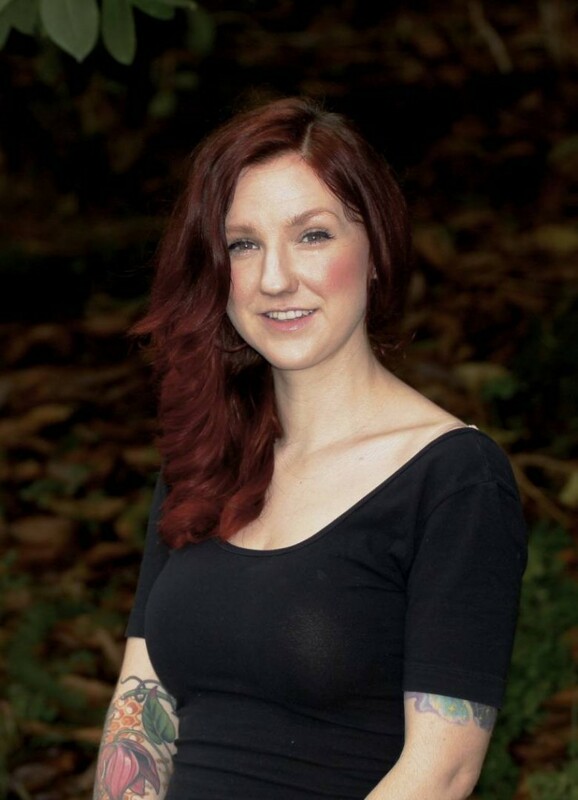 Amy Sidwell has been hired as the new Branch Manager. Issues with parts delivery timelines and cost mark up are emerging following VSR’s reorganization of the warehouses. The Local is seeing some minimal improvements in grievance response timelines. Just before Christmas, a senior terminated member was brought back to work after the Local was able to successfully argue that the level of discipline was unwarranted and inappropriate. Serious OH&S issues at REFM continue to be followed up on. New Stewards have stepped up for Jericho and in REFM for Asphalt /Drainage and Structures/Welding. A demotion grievance was recently won and this win will have implications to multiple other live cases of a similar nature. Concerns about WCB rate of pay have been corrected. OH&S Committee has identified serious hazards in both work yards that will now be looked into. The Local has set dates in June to go to arbitration for a terminated employee. A grievance has been filed regarding changes to the Wellness Program due to the PHS changing the way it supports staff suffering from addiction issues. A job description review will be done for our members in the near future. For three months a CUPE 1004 member, Ryan Petrin, was booked off from his regular duties at the City of Vancouver as a Streets member, to work on the United Way campaign. Over the months Ryan would travel around the Metro Vancouver area helping to coordinate United Way community programs, give speeches to a variety of events, develop information materials, as well as share the message behind what United Way does. Ryan has worked with the City for a number of years now and is a young worker, job steward, and union activist. Ryan -Thanks for all of your hard work! The staff at the Camosun College Faculty Association have reached a tentative deal with their employer. Tony Cheng, a worker for the City of Vancouver engineering department, has gone over and above his good deeds for the year. 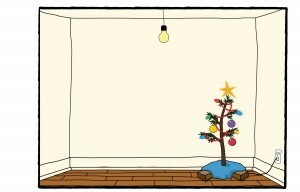 He organized a toy drive this holiday season to help children of low-income families in the Metro Vancouver area to enjoy Christmas morning. The Lower Mainland Christmas Bureau sent the local a letter thanking everyone for their donations. With the collective power of this local, 228 toys and $750 in Superstore gift cards were raised. Thank you Tony for all of your hard work! The November meeting did not have quorum, but a short information meeting was held. The following positions are vacant and nominations will be sought at the December membership meeting. 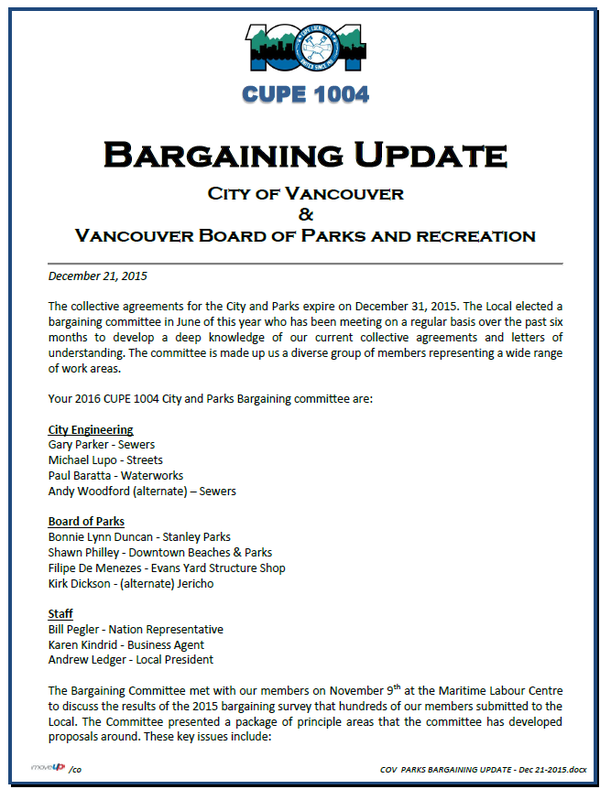 The City of Vancouver engineering and parks workers are preparing for another round of collective bargaining. The agreement expires at the end of 2015 and the bargaining committee wanted to be organized and prepared. Bargaining notice was sent to the employer. 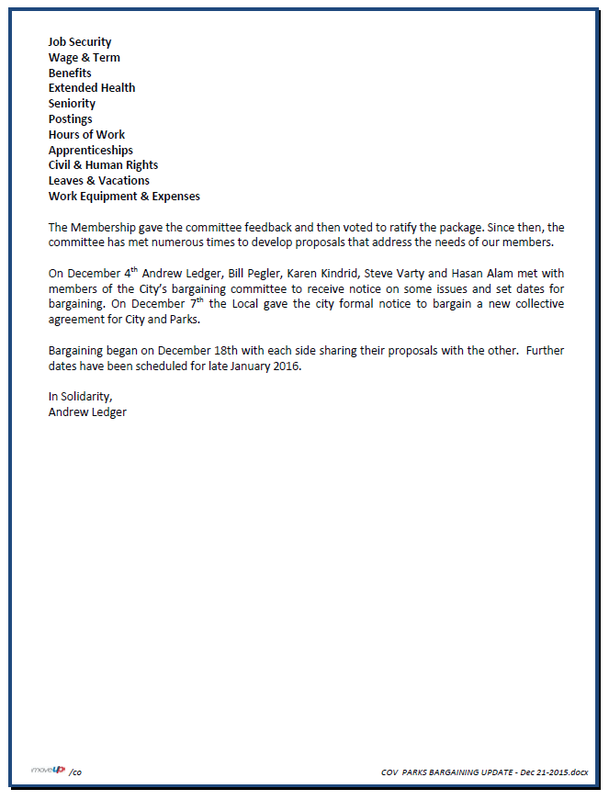 The bargaining committee was elected by the members. Best of luck to the bargaining team! Delegates at the 2015 CUPE BC convention were informed by CUPE National that there are free website templates available for locals to use. As CUPE 1004 was in the midst of discussions in regards to what to do with it’s current website, the free template seemed like the best fit!